A plotted revenge comes to nothing; the site for its staging swallowed up in a new mall. Mallification is not so much a building project as a transformation of consciousness; sentimental staging posts for unhappiness in transit, a filtering of actions through nostalgia as if it were a kind of choosing, the unpicking of narratives in favour of the images of things. In a world where brands have the same legal status as individuals, the meaning of “individual” changes. That is the key to Ewan Morrison’s engrossing Tales from the Mall. Its mix of fiction and critical documentary has the same feel as John Schlesinger’s 1961 TV doc ‘Terminal’, sharing its abrupt switches between deadpan commentary to family melodrama. It finds wonder in the ordinary, while exposing just where that ‘ordinary’ is constructed and how. Here are itemised lists that are charming in their charmlessness, brutal responses to suicidal jumpers brutally described, and accelerationist prescriptions for improving malls by making them worse. Most impressive is the juxtaposition of micro-narratives with cunning displays of factoids; reeling in a blizzard of youth culture references and overwhelmed by those moments when the accumulation of grumpiness and prejudice transcends itself and reaches for the Sublime (fantasies of genocide in the mall) the reader is in for an upsetting read in the best sense. 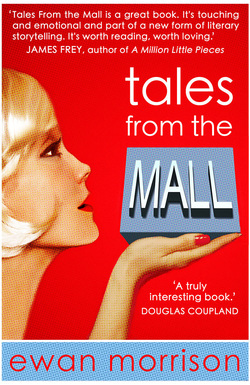 ‘Tales from the Mall’ illuminates unknowns in what seems plain. The bleakest parts of the book are where Morrison details the relations of consumption: “the structural devices to deter the urban poor”, the branding of subjectivity, the tragic hopefulness of “MALL STILL OPEN”, the marketing of solitude. The path to mall-building was paved with ‘good intentions’; designed as the equivalents of “great civic parks”, places where people could engage with each other and where the demos could practice its everyday democracy; it took a particularly twisted, paternalistic utopianism, pioneered by planner Victor Gruen, to thump down the state-like structures necessary to hold together the spasms of cornucopia and the longeurs of industrial-strength loneliness. Morrison’s achievement is to find a literary form for these tensions, entertaining us by turning light-emitting diodes into a bonfire.